Andrea shares a step by step picture tutorial of how to fold these paper lilies on her blog, Charcoal & Crayons. There are so many ways you could use these to decorate for Easter. I am just wondering if it would be possible to fold a napkin the same way. You would probably need way too much starch to get the petals to hold their curl. 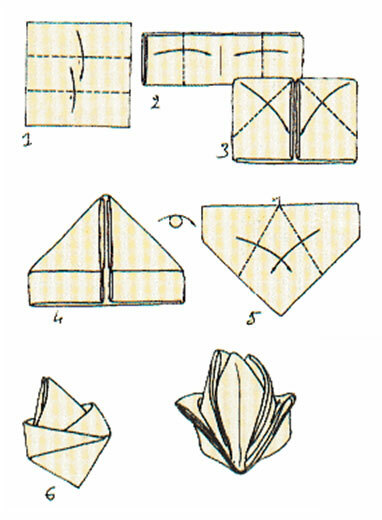 I did find a tutorial at Gourmet Heartbeat for folding a napkin into the shape of a lily. They even have a video, but they don't look as pretty as the paper version. I think folding the napkin in a plain old rectangle and using it as a backdrop for these pretty paper lilies would be better. 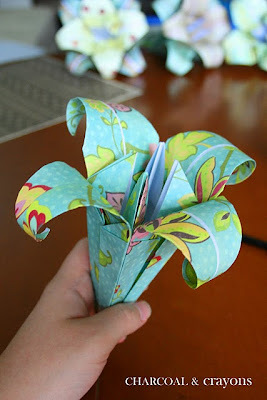 You can see the tutorial of theses beautiful paper lilies HERE. Google hates me. I've had to sign in to leave every single one of these comments. You're worth it. I am absolutely thrilled that you have mentioned my paper lilies... Thank you! I'll have to try out the napkin version as well. I should show these to my 10 year old so he can make me a lovely bouquet for Mother's Day. So beautiful. Thanks for sharing. I don't think I am skilled enough to make these...but I do appreciate looking at them. Tell Char I'm the Google Queen and I'm sabotaging her chances.